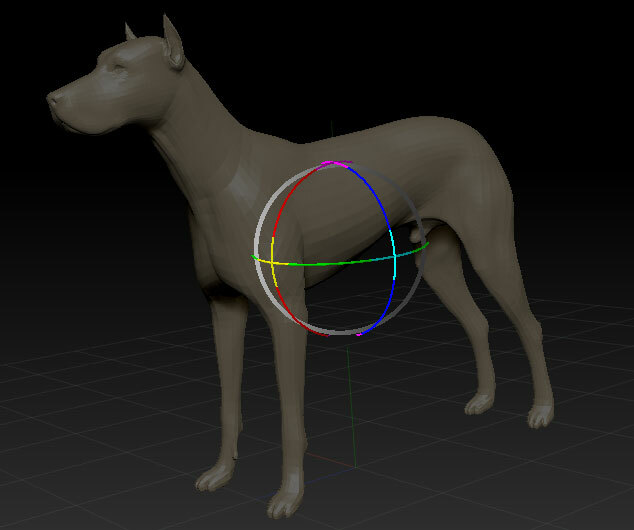 The Gyro is a control that appears when ZBrush is in Paint Mode, and one of the Move, Scale, or Rotate buttons is pressed. When the Gyro is visible, it allows you to place the most recently drawn stroke. Note: The Gyro can be used to position any type of stroke, not just 3D objects. With the possible exception of scaling an object along an axis or plane, the gyro is not the best way to manipulate objects while in 3D Edit mode. Other shortcuts available in that mode make it quick and easy to position the model while doing sculpting, texturing, etc. By default, the Draw pointer is active, which means that dragging in the workspace draws with the current tool. After drawing a 3D object, you can use the Transform palette functions to move it around the workspace, rotate it around its pivot point, and scale it with respect to the pivot point. To start, click the respective icon. The Gyro is a three-dimensional transform assistant that consists of three multicolor rings that move and rotate along with the object, plus a fourth, gray ring that moves with the object, but always stays parallel to the view plane. The colored rings let you perform transformations with respect to any local axis or plane of the object. The gray ring lets you perform move and rotate transforms with respect to the view plane, no matter what the orientation of the Gyro is. When you draw an object on a blank background, its Z axis is perpendicular to the view plane. If you then activate a transform mode, you can see the Gyro’s blue ring, which allows rotation about the Z axis, but because you’re viewing the green and red rings edge-on, they appear to be lines. Note that other colors mark the ring intersections; for example, the intersection of the red and green rings is yellow. We’ll cover the reason for these different colors shortly. Note: The Gyro’s size remains constant throughout any transforms. Sometimes it’s smaller than the object it’s attached to, but sometimes it’s larger. Note: You cannot undo transformations on an object. However, transforming doesn’t modify an object’s basic geometry, so you can always select the Draw Pointer and press Undo to clear the object and draw it again. 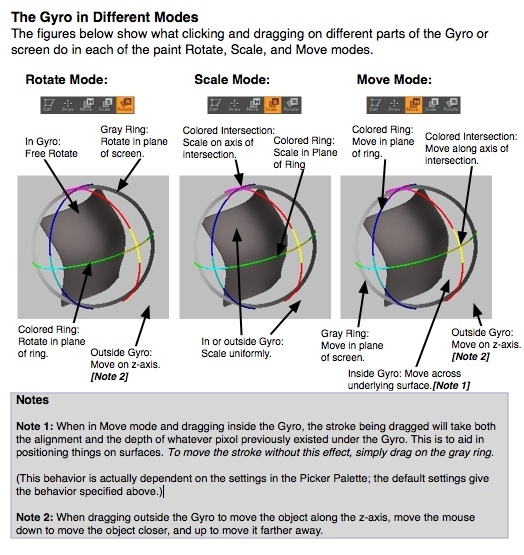 This section begins by describing the use of the Gyro to rotate objects, because its functioning can most easily be seen in this mode. To rotate the object on its z (in/out) axis, drag the ring around the outside of the Gyro. At this point, the gray ring coincides with the blue ring, so you can drag either the gray or blue part of the outside ring to achieve the same rotation. To rotate the object freely, drag anywhere inside the Gyro except on the other rings. you can then rotate the object around any local axis by dragging one of the colored rings. When you drag a ring, you’re rotating the object around an imaginary axis that goes through the center of the ring, perpendicular to the plane of the ring. Note: To rotate in 10-degree increments, press and hold the Shift key as you drag a ring. To rotate in 90-degree increments, hold the Shift key as you drag inside the Gyro. Dragging the ring intersections (colored cyan, magenta, and yellow) has no effect with the Rotate tool. As before, you can still drag the gray ring to rotate the object around the screen’s in-out axis. You can also drag inside the Gyro, away from the other rings, to rotate the object freely. As you saw in the previous section, Rotate uses the colored rings for rotation around an object’s local axis, but not the ring intersections. Move, on the other hand, uses the axis intersections for single-axis local translation, and the rings for planar translation. But there are several other modes as well: You can move the object parallel or perpendicular to the screen, or with respect to the drawing, so that it constantly reorients itself depending on the surface normal of the existing pixols. To move the object parallel to the screen, drag the gray/blue circle, away from the ring intersections. To move the object along the line between the intersections of the blue and green axes, drag either of the cyan intersections. To move the object along the line between the intersections of the blue and red axes, drag either of the magenta intersections. To move the object perpendicular to the screen, that is, on the screen in-out axis, drag outside the Gyro in a vertical direction. Dragging upward moves the object away from you, and downward moves it toward you. Note: By default, ZBrush’s window presents an orthogonal view-—it doesn’t use perspective–so an object doesn’t seem to change in size as it moves closer and farther. It simply changes position with relation to other parts of the drawing. Note: If you move an object very far back, it first becomes partly covered by the back clipping plane, and if you keep moving it back, it becomes fully hidden. Note: This reorientation always overrides any existing rotation you’ve made to the object. If you want to keep an existing orientation as you move an object, drag using the rings. Also, if you move an object over the background using this method, it automatically snaps to the back clipping plane. If you then rotate it, parts of the object may move behind the clipping plane and become hidden by it. In such cases, move the object forward by positioning the cursor outside the Gyro and dragging downward. Two additional move modes become available after the cube has been rotated, whether explicitly with the Rotate function, or implicitly with the last function. To move the object along the line between the intersection of the red and green axes, drag either of the yellow intersections. To move the object along the plane formed by any two of its local axes, drag the corresponding circle instead of an intersection. In the following illustration, the sphere was added first. The cube was then added on the background, and then converted to pixols (via Snapshot–discussed later) and moved several times. The green cube (#1), on the sphere’s upper left, was dragged by the gray/blue circle. The magenta cube (#2), on the sphere’s upper right, was dragged first by the gray/blue circle, and then was moved closer to the viewer by dragging downward outside the circle. The blue cube (#3), at the bottom of the sphere, was dragged by the cube surface, inside the circle, so that it automatically aligned itself to the sphere surface. Finally, the blue cube (#4), in the center, was dragged by the cube surface inside the circle, and then moved closer to the sphere’s center by dragging the yellow intersection upward. Scaling objects in ZBrush is fairly straightforward. As with Move, Scale uses the rings to resize objects in two dimensions, and the ring intersections to resize in one dimension. Note, for objects drawn on a blank canvas, the object must be rotated slightly before scaling on the yellow (in/out) axis. You can’t scale using the gray ring; that would skew the object’s shape (however, this kind of distortion can be performed by editing the object). To scale in three dimensions, drag anywhere away from the rings. The following illustrations show several different types of scaling, using a rotated object. Pictorial reference for the Gyro.